Sri Lanka’s leading Professional and Higher Education institute, PACE Institute recently added Scottish Qualifications Authority (SQA), an international leader in education and qualifications development, among our prestigious education partners that already include such glittering names in the domain as Red Hat, Digital Marketing Institute (Ireland), and Star Certification (USA). Accordingly, PACE Institute has been named an ‘SQA Approved Training Centre’, which empowers PACE Institute to provide training and lectures for a host of SQA Advanced Diploma Programmes, successful completion of which will qualify a candidate to start reading for an internationally recognized top-up degree programme in a related subject at leading SQA’s partner universities in the USA, the UK, Australia, Canada, and New Zealand. 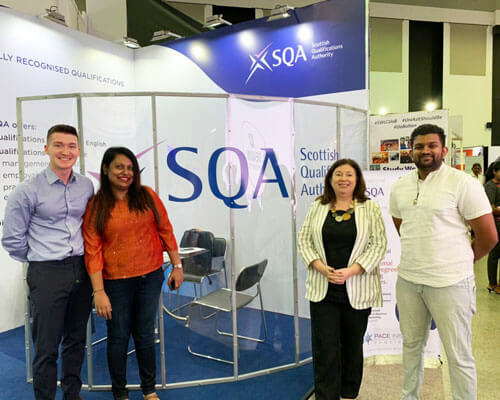 SQA boasts 100+ years’ experience in education and qualifications development and 1700 SQA Approved Training Centres around the world, which positions it among some of the most iconic names in the domain of higher education. With the partnership well-forged, we’re in a strong position to strengthen their higher education credentials further. 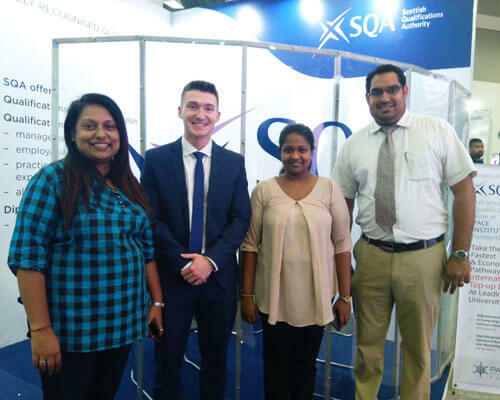 We also participated in the recent EDEX Expo at the invitation of SQA to promote the courses we’re offering as an SQA Approved Centre in Sri Lanka. Representing the PACE Management team, Sajini de Silva - Director, Sulakshana Rathnayake - Institute Head, Rajitha Kumarasinghe, Business Development Manager, Shehan Tharuka, Senior Business Development Executive attended the exhibition with SQA Management Representatives, Mr. Gary Collins - International Project Officer, South Asia and Ms. Margaret Curran - International Regional Manager, South Asia joining from the SQA’s side. The exhibition ended on a high note and instilled confidence in both PACE and SQA Management teams about the possibility of fruitful collaboration in the future.